Tasty (and *somewhat* healthy - score!) gingerbread cookies that are sure to spice up any special event. The best part is that gingerbread cookies taste GREAT all year 'round... well, all cookies do... BUT, the decorations can easily be tweaked to suit any holiday or fun-filled occasion that calls for some yummy treats! Begin by mixing together the wet ingredients (butter and vegetable shortening) in a high-speed mixer - I use a Kitchen Aid. Beat in the egg and molasses. In a separate bowl, mix together all of the dry ingredients (flour, baking powder, cinnamon, ginger, salt, cloves, allspice, and light brown sugar). Once all of the dry ingredients are mixed well, add them to the mixer, a few tablespoons at a time, with the wet ingredients. Knead until the dough becomes thick and uniform. Separate the dough into four flat circles and cover them with plastic wrap. I made the dough at night and decorated the next morning - this allowed it to have enough time to set overnight in the refrigerator. If you are making the dough the same day you plan on decorating, allow it 2-3 hours to set beforehand. Preheat your oven to 350 degrees. Place two long sheets of parchment paper on a hard surface and lightly cover them with more whole wheat flour. Remove the dough from the plastic wrap and roll it out flat, using a wooden rolling pin. 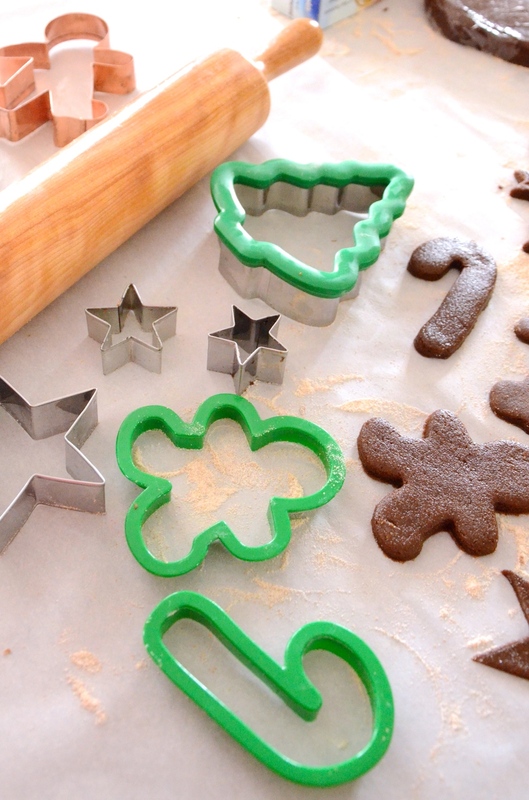 Using any cookie cutters of your choice, begin to cut out shapes with the rolled dough. I used gingerbread man, snowflakes, candy canes, Christmas trees, and stars. Remove the cookies from the parchment paper and transfer both sheets to two separate long baking sheets. Lightly coat them them with cooking spray and arrange the cookies on top, about 1/2" - 1" apart. Allow the first batch to bake for about 10 minutes on the middle rack of the oven. Check on them after a few minutes to make sure they are not cooking too quickly. Remove the first batch and cook the second batch for the same amount of time. Place the baked cookies on a cooling rack and allow them up to one hour to fully cool down before you begin to decorate. I used Wilton, gel-writing frosting for the decorations, along with mini M&Ms and Sour Punch candies for the buttons. This is where you can get creative and really have fun with the cookies! You can try any design or pattern - there's really no right or wrong way to do this part.